The Karen Carpenter Fan site since 1996! Karen Carpenter touched many lives with her haunting vocals as part of the duo the Carpenters. This site will give you a brief, yet insightful look into the life and death of a superstar. Join millions of fans and experience Karen Carpenter like you never have before. “If We Try” is a song from Karen’s solo album written by Rod Temperton especially for Karen. He wrote it after he took up residence in Phil Ramone’s guest house in Connecticut. During the same time Karen was living in Ramone’s main house. Rod wrote the song after several weeks of knowing Karen. “Two Sides” is a country-tinged tune featured on the 1977 album “Passage.” Many fans consider this a missed opportunity feeling it could have been a hit single. This elegant song features a quartet of guitars with Tony Peluso playing electric guitar. For diehard fans of Karen’s solo album!!! Your help is very much appreciated. Any purchases made through the Amazon.com link below will help to keep LeadSister.com on the internet. Thank you for your help! 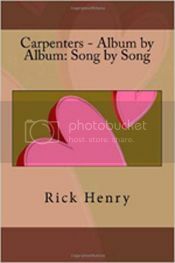 A must-have for any die-hard Carpenters/Karen Carpenter fan. Replica of the original Carpenters Logo featured on their albums and other promotional material. Decal/Bumper Sticker now available at Amazon.com!